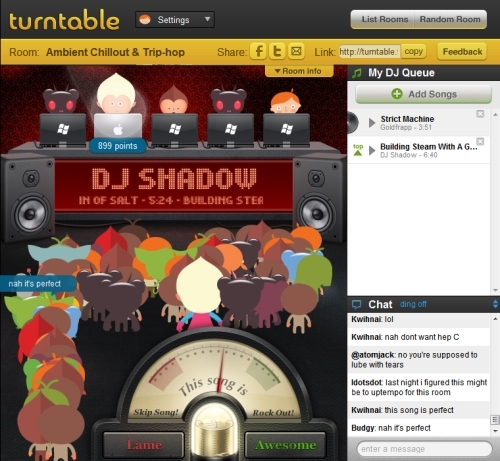 In one of the more bizarre (from my perspective) changes in a company’s business model comes Turntable.fm. Remember Stickybits – the company that allowed you to place a bar code on any object and ‘internet-ize’ it? Well, according to The Next Web, the founders have made a huge right hand turn and shifted their attention to a ‘social listening’ project where each of us has a hand in the music that is being played. The invite list is ‘sort of’ exclusive. You can only sign up if a friend of yours on Facebook is currently a member. Not hard for most of you with more than a hundred or so friends. Upon entry, you can step up to the podium and spin your music against 4 other ‘Social DJs’. The audience decides which of the DJs lays down the next track through a simple voting system. What’s brilliant about this is a combination of social interaction, visual simplicity (fun anime characters right down to the PC vs. Mac DJs), and the ability to hear a variety of music you might not otherwise be exposed to if you were only choosing the tracks in a particular genre (The Next Web calls this out under ‘Music Discovery’ – dubbing it a ‘more social’ version of Pandora or Last.fm – spot on, in my opinion). Even better is the fact that I get to ‘save’ tracks that I’m interested in by adding them to my Turntable Queue, Last.fm, Spotify, or iTunes. +1 Turntable – thank you for not making this a walled garden. I’ve found myself spending more time here than on my other go-to music services in the last few weeks, and am finding that I’m not the only one enjoying the addition of a new player based on my Facebook feed. With all of the social exposure that Turntable is experiencing, I’m anticipating that there will be a level of push back from the labels pertaining to rights of the tracks that are being shared (something Pandora is well versed in). Big right hand turns don’t always pay off… In this case, I think the founders of Stickybits made a smart choice. They’ve created an ‘venue’ where the casual listener can discover new music, independent artists can use it as a platform to promote their own creations, and brands can host an experience within the environment connecting directly (in real time) with their consumers through a brand experience and group chat. Looking forward to watching the service continue to evolve and make the social music landscape even more competitive. Our APAC team is on a roll. Earlier this month they came out with The Museum Of Me – a personal ‘walkthrough’ of your activity on Facebook – in the form of a short film. Brilliant work that went viral almost immediately (1M downloads the first day, nearly 4M to date), with ZERO paid media to promote it. That same team has not rested on it’s success, following up Museum Of Me with a sequel to our hit ‘The Chase‘ entitled ‘The Escape‘. It’s YouTube as you’ve never seen it before – an interactive experience layered on top of a ‘Visibly Smart‘ Film. The teaser trailer is below, if you’d like to get the full experience visit our site and see if you can…Escape. Clearly this blog is hosted on WordPress so I’m partial to the environment, but I’m playing around with Tumblr a bit and liking the format. As far as usage, they are neck and neck – as reported by Technology Inc. – both closing in on 20M users rapidly. Many users prefer Tumblr due to it’s ease of use, ability to ‘quick publish’ via email, and it’s design flexibility. WordPress seems a bit more robust on the customization front to me, but may be more than most simple bloggers need. In the news lately is a guest post by Steve Rubel (Twitter) on the The Next Web, on why he “….adopted a scorched earth policy, dismantled two blogs and jumped to Tumblr“. 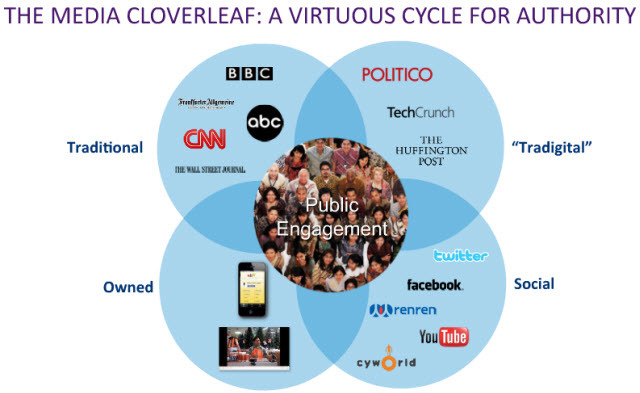 Basically saying that he feels Tumblr is at the center of the ‘Media Cloverleaf’ (image courtesy: Mashable) and is uniquely positioned to take advantage of a highly social, extremely engaged audience with the ‘connective’ tissue that ties in the major social hubs (Twitter, Facebook, YouTube) with those traditional media outposts (CNN, BBC, etc) and emerging ‘tradigital’ pioneers (The Next Web, Sports Blog Nation). What’s right for you? I’m experimenting – ala John, but have not made the bold move Steve made with his personal social platform of choice – yet. Stay tuned and please weigh in with comments.